Quietest 60 gallon air compressor - The Industrial Air ILA4546065 ! Welcome to compressor class, kids. Let me school you on why the Industrial Air ILA4546065 60-Gallon compressor has earned a gold star from the Teacher (me). Yes kids, this is the best air compressor for your buck. I am a small business owner, and that means: (1) I don’t have money to just throw around, and (2) my reputation is my most precious asset. I own a small body shop, and the work my employees produce is scrutinized by my clients, who want their vehicle to rise like the Phoenix from my garage, once the bill is paid. We use this industrial grade compressor both to prepare and paint surfaces. I love that I have the power and efficiency I need in this machine, without draining the power grid and pummeling dear old Mother Earth. I also appreciate that I can hear myself think when it’s running. The reviews I find online usually copy a few stats from the manufacturer, and say “works fine!”. Thanks, bud. But, I need a bit more detail. Here are some true specs and what I think from A to Z. Make sure and double-check with the Industrial Air people and do your homework before buying! The large tank delivers 14 CFM at 90 psi and that large tank also means long run time. The ILA4546065 runs on electric to power its 4.7 Horsepower, 240 Volt heavy-duty motor. It gives a max of 155 psi. Its durable inner workings include a cast-iron 3-cylinder, oil-lubricated pump. The whole thing weighs 250 lbs, with dimensions at 38 x 29 x 76 inches. It takes under 5 minutes to get from 0 – 150 psi and then under a minute for recovery (about 120-150). The ILA4546065 package comes with a 2-year limited manufacturer warranty and includes a metal belt guard and synthetic oil. Has intuitive standard functionality; on/off switch, pressure gauge…etc. Also, shipping was a sinch (easy), but I suppose that varies from place to place. I haven’t had it long enough to say for certain myself, but I don’t know a soul who has had anything go wrong with these beauties. We’ve dealt this machine a good beating at the shop, and it’s still kicking out those beautiful 150 (approx.) pounds. Reviews online said it’s “long lasting”, and that’s looking true. Stay tuned! Watch out for shady shipping folk, boys and girls. 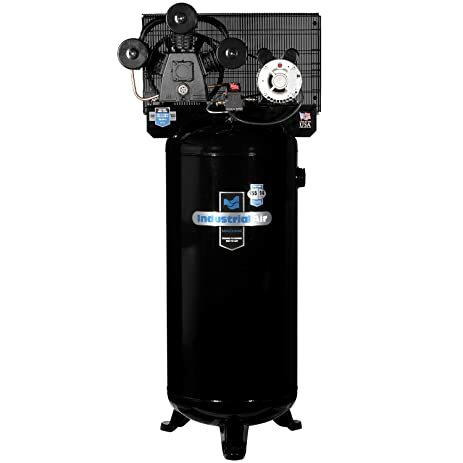 It has nothing to do with this dependable professional compressor, or the nice people at Industrial Air, but the driver might ask “where do you want it?” at delivery, then, after dropping it in your shop, you get a bill in the mail for an extra $105 for the trouble. If you know you’re going to be using this machine in heavy-duty contexts for many years, this is your compressor. You will have the power you need to operate tools well (even two 90 psi at the same time) without worrying about complex or more fragile pump systems that require diligent maintenance. Set it, forget it, and get the job done. Then, keep doing it 12 hours a day and 6 days a week. The take away here, kids, is that this is the best stationary air compressor to rely on day-to-day, especially in an enclosed shop setting. Oh it’s also our suggestion for quietest 60 gallon air compressor to buy.